Super-soft blended crew shirt. 60% combed ring-spun cotton 40% polyester jersey. 4.3 oz. fabric laundered for reduced shrinkage, 32 singles for extreme softness, slightly heathered. 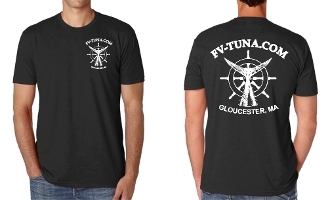 Printed new FV-Tuna.com tuna tail wheel design on left chest and back.